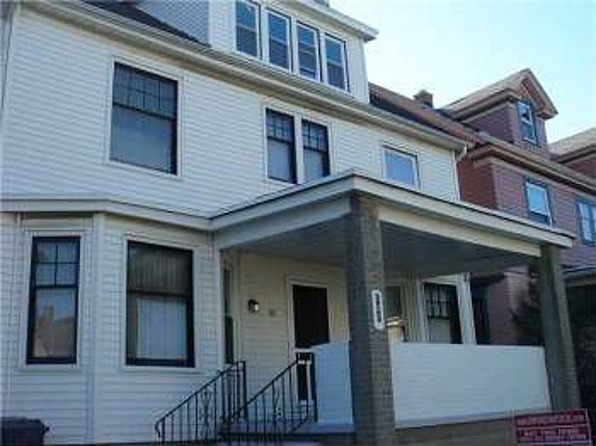 Yesterday we closed on the house and we wasted no time getting in there. The front door was beat up and in rough shape. I was not comfortable with the door that was on there. 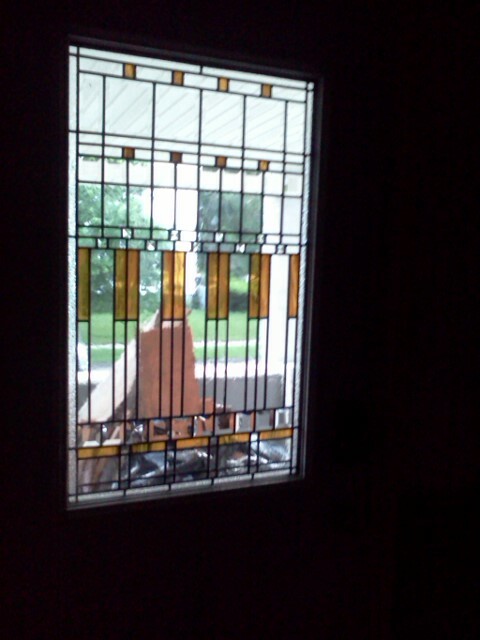 My mother works for a windows and door company so we were able to get a great new front door with really pretty stained glass. This is the way the house looks now except the pillars have been painted. 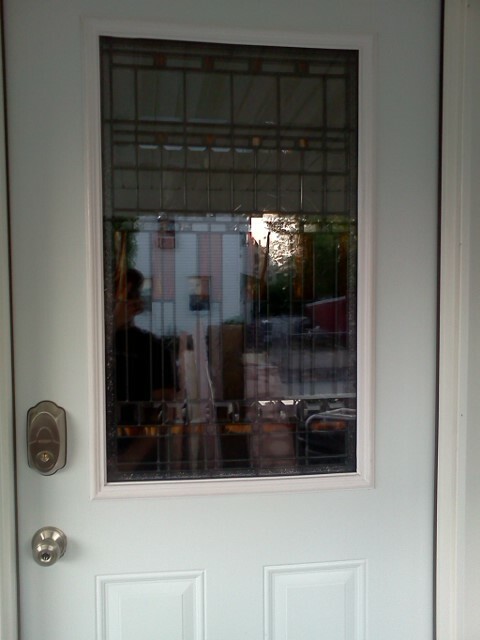 The new door in the front. The new door from the inside. The new door was replaced this morning. It took the install guy almost all day to re-frame the door. Our house is really old so nothing is really level anymore and he had to re-build the frame according to the angles that the house has set at over the 120 or so year that its been around. After a days work, he finally was able to put it in and it looks awesome. The deadbolt lock is a finger scanner. The concept is totally awesome however I haven’t been able to get it to work properly yet. I ended up messing it up and the only way to reset what I had done was to pull the batteries out for 24 hours and then give it another try tomorrow. Hopefully I can get it! Then we will forever make Star Trek noises while scanning our thumbs to get in the house. When I finished work today at 2:30pm, I walked down to do some more work in the yard. The back is pretty crazy and a complete mess. I did some cleanup until our contractor arrived. I thought that he was just dropping off his tools today, but within minutes we were tearing out that old kitchen. We first ripped down the drop ceiling and then tore out all of the built in cabinets that were probably original to the house. Each board that we yanked off was coated in 3 different wallpapers and covered in some sticky foreign substance. It was pretty gross. 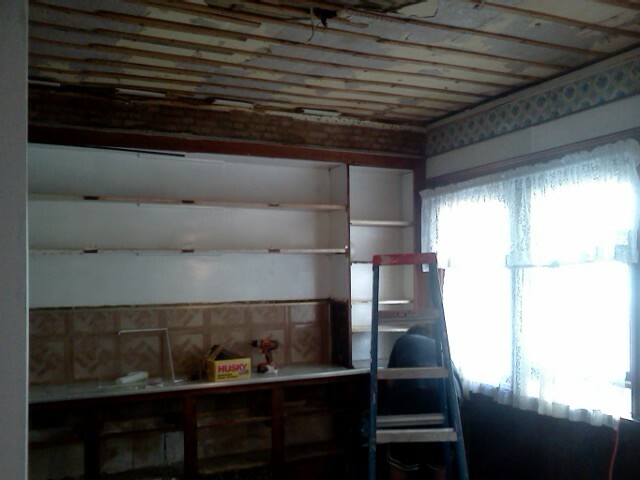 First we tore out the drop ceiling. 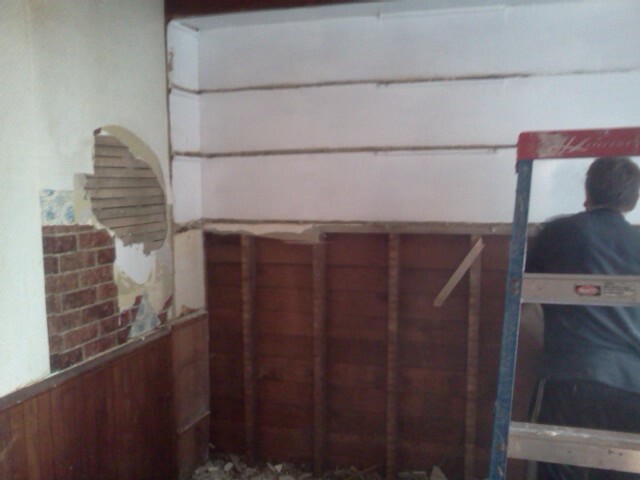 We then has to tackle the cabinet wall. Here is Al our contractor, about half way done with the wall. 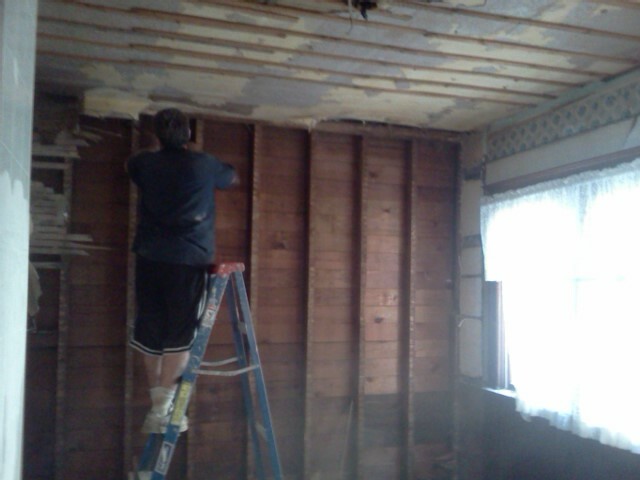 After pulling down the drop ceiling and tearing this wall apart, we cleaned up and called it a day. There was so much dust I could barely see, I looked like a coal minor. 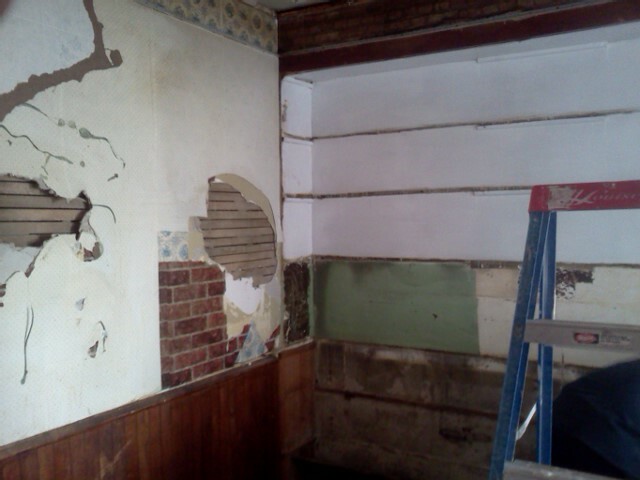 Tomorrow we plan on tearing out the ceiling, and knocking out a portion of the wall to the left of the cabinet wall. This is going to open up the kitchen a lot more and really make it look awesome. 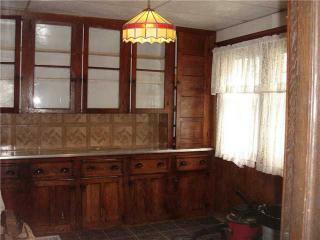 The older houses are large, but most of the time, they are split up into smaller rooms. This kitchen needed something to make it bigger. More to come tomorrow! New House/Home of Super Sweet Shirts!